Barbados Surfing Lessons with Zed's! Offering some of the best surfing lessons and surf holidays in all the Caribbean! We offer surfing lessons and surf tours using the industry's best surfboards to ensure safety and quality. If it is a surf holiday or surfing vacation you are looking for, then Barbados is the best choice you can make. 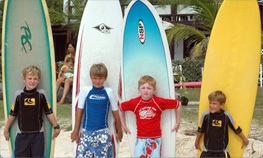 Since 2002 we have been the leading Surf School in Barbados, and we are constantly working on our teaching techniques to accommodate all types of people. It is great fun for the entire family! We also offer private surf lessons for those who want undivided attention; great for couples on honeymoon and families looking for a fun activity in the water. Our one day "Get Wet" Summer Surf program offers 2 hours with an instructor, pick up and drop off to your hotel (South Coast only), and a board rental for the day. This surf lesson has been designed to give you a taste of what it is like to ride waves in a safe environment. Check our surf lesson page for more info.